SanFangQiXiang is part of the Tentative list of China in order to qualify for inclusion in the World Heritage List. 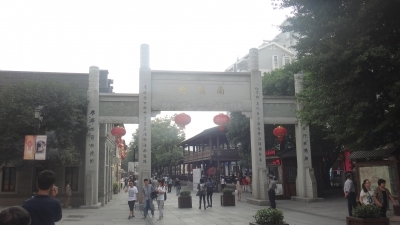 Three Lanes and Seven Alleys is a small block in Fuzhou city that represents its old town. Having seen grande old towns at Lijiang and Pingyao makes this seem very puny. The entire urban planning aspect is invisible to visitors. I also did not see any guided tours coming in to explain anything but I'm sure there are. I think that may be worth it as like I said it just feels like a modernized old town with the McDonald's (or was it Starbucks) disguised in a tiled roof and wooden facade. Whereas I'm glad this part of the city is protected and the snacks don't seem overpriced to make you think it's a tourist trap, I wouldn't come this all this way just for seeing Sanfangqixiang. It was actually a stopover from Wuyishan to flesh the trip out a bit. You can stroll around the alleys for a good hour or so, having snacks and taking pictures of the buildings. I can see this making the inscribed list in a few years seeing that it's China and the cultural aspect is genuinely interesting.